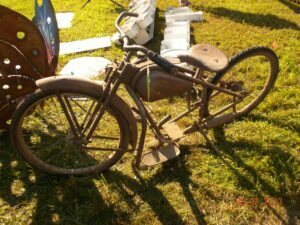 If you are one who believes that one man’s junk is another man’s treasure, then The Longest Yard Sale is for you. It is always during the first week in August, this year it will be August 6, 2015 through the August 9, 2019. Because most of the vendors are individuals, you never know what you will find and it goes on for over 600 miles. Yes, I said over 600 miles. The trail runs from Addison, Michigan all the way down through Ohio, Kentucky, Tennessee, Georgia and ends in Gadsden, Alabama. The majority of the route follows Highway 127. My husband and I, along with my sister and her husband, have done this for four years in a row. The first year, we started at Cincinnati and went down to Kentucky, the next year we went to Tennessee and up through Lexington, Kentucky, and the third year, we went to Cincinnati and went North. Our favorite has been starting at Cincinnati and going down to Kentucky. However, all four years have been a blast! You get to see new places, get to meet a lot of new people and best of all, you never know what treasure you might find! I recommend to get started and let the garage sales be your guide, there are a number of hotels along the route for last minute plans. -Be ready to hold your patience. There are a lot of people who participate in the longest yard sale, expect to see people moving about in all directions. Traffic and trailers is what you will see. Go slow and be careful. -Be prepared with goals. Make a list of the things you would like to find and decide ahead of time what you are willing to pay for it. It is easy to get “caught up in a moment” and spend too much for an item. -Be comfortable. Wear your most comfy shoes, as you will be walking – a lot. -Be protected. Put on sunscreen to protect you from sunburn. It gets hot quick and morning sun is the worst. -The weather is normally hot so take a little cooler with ice, water and your favorite drink, I promise you will be glad you did. Check out some of my pictures along the route! 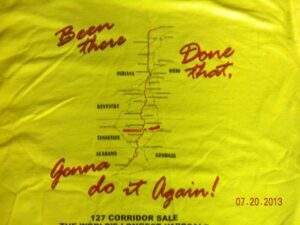 I included a shot of the t-shirt from 2013, which depicts the Longest Yard Sale route. It pinpoints some of the larger stops along the way. Go ahead and just do it! Don’t forget to come back here and post to share your pictures!